Let's start with something basic - with data. Since in machine learning we solve problems by learning from data we need to prepare and understand our data well. This time we explore the classic Boston house pricing dataset - using Python and a few great libraries. We'll learn the big picture of the process and a lot of small everyday tips. I'd be following a great advice from the Machine Learning Mastery course which probably is applicable to any domain: In order to master a subject it is good to make a lot of small projects, each with its clear set of goals and producing to a set of artifacts - a github repo, a blog article, etc. This way we can focus on one thing at time, finish each project quickly and happily and build a momentum which can lead us towards bigger projects. Otherwise, if we instantly set a big goal the path can be very long and complex, the goal blurs and we might lose our motivation. When I get a dataset and a ML problem associated with it, what should I do? For this evening we'll explore one of the classic machine learning datasets - Boston house pricing. To ask the right questions in our analysis we can start with a path outlined in the Applied Machine Learning Process book. More details and motivations are described in that book or can follow from our curiosity. Why does the problem need to be solved? How would I solve the problem (manually)? In this article I'd like to describe my solution which is available in the ml-playground GitHub repo dedicated to learning Machine learning. The results of both parts (problem definition and data analysis) are presented in two Markdown files along with a lot of images. For the data analysis part I wrote a rather simple Python script data_analysis.py. All the plots in data_analysis.md can be automatically generated by running this script. The dataset is taken via one of the Python libraries. The dataset is available either for download from the UCI ML repository or via a Python library scikit-learn. The Python language and the ecosystem of libraries make it a excelent tool for data analysis and machine learning, so we'll use it in this mini-project. I encourage you to work interactively and proceed one step at time. A great interactive console for Python is ipython. Also if you don't use it already, google for pyvenv and pip. The dataset consists of a table - columns are attributes, rows are instances (individual observations). In order to do computations easily and efficiently and not to reinvent wheel we can use a suitable tool - pandas. So the first step is to obtain the dataset and load it into a DataFrame. So it is easy to convert it to a pandas DataFrame. The process of cleaning and preparing data always depends on data at hand. As an excercise you can try to clean and load the raw Boston dataset from the UCI archive. Now we have the data available in Python waiting for us to explore them! We'd like to get a simple report like this: data_analysis_report.txt. The most basic thing is to get the data size: number of attributes (features) and instances (data points). In fact the attributes can be divided to input ones and target ones. In this case there's just one target and several inputs. The concrete meaning of attributes is described in the report. It is good to know if some values are missing. In pandas missing values are represented by np.nan. The pd.isnull(df).any() command tells us whether each column contains any missing values, pd.isnull(df).sum() then counts the missing values. There are (un)fortunately no missing values in this dataset. It is useful to know whether some pairs of attributes are correlated and how much. For many ML algorithms correlated features might make some trouble, ideally we should try to get a set of independent features. However, there exist some methods for deriving features that are as uncorrelated as possible (google for PCA, ICA, autoencoder, dimensionality reduction, manifold learning, etc.). 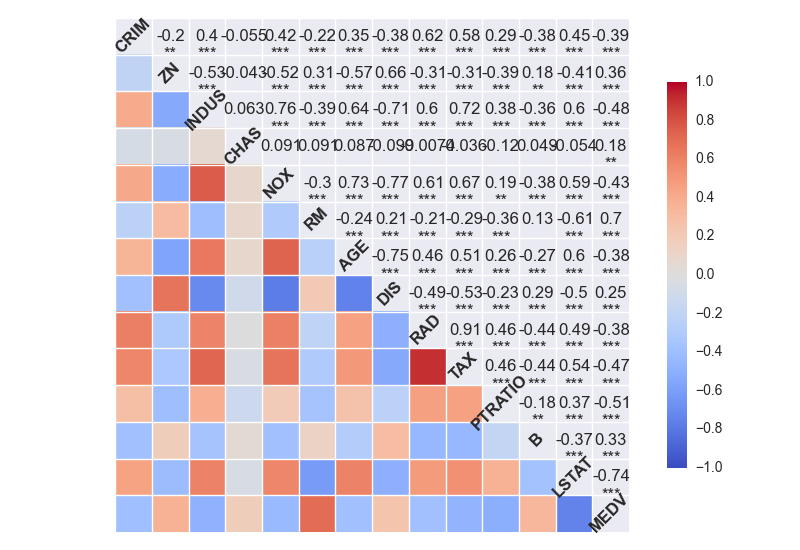 Pandas offers us out-of-the-box three various correlation coefficients via the DataFrame.corr() function: standard Pearson correlation coefficient, Spearman rank correlation, Kendall Tau correlation coefficient. See Wikipedia for more information. %timeit is a command in ipython useful for micro-benchmarking. Besides correlation between attributes, we'd like to know the correlation between input attributes and the target one, ie. how each input attribute is able to predict the target. It is called predictivity. The np.argsort() function returns the array indices that when aplied to the array return an array in sorted order. In order to better understand the dataset we can make things visual. Basically we generate a lot of various 1D or 2D plots and look at it hoping to find something interesting. Indeed, we, humans, are being highly trained to get information and find patterns visually. There are Python packages that can help us with this task very much. 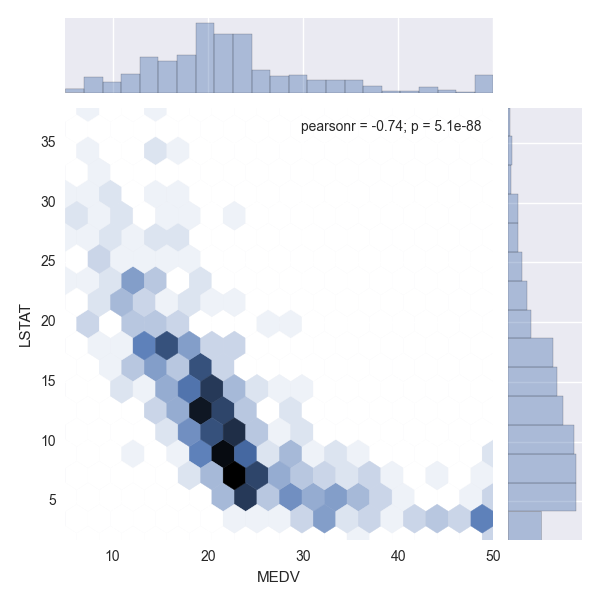 In particular, we use the standard matplotlib package and additionally seaborn for some extra statistical plots and for more elegant and comprehensible plot styles. While examining the dataset interactively we can utilize the default interactive plotting features. However for reproducibility and publishing our results eg. on a blog, we'd like to export the plots to images, eg. PNG. Python can help us to automate the things. We'd like to plot the value of correlation of pairs of attributes, ie. a 2D matrix. To avoid duplicates (due to pair symmetry) just one triangle is enough (eg. lower triangular matrix). The range of correlation value is [-1; 1], thus the value can be color coded using a diverging color map - one hue for each sign (eg. red/blue) and saturation for absolute value. 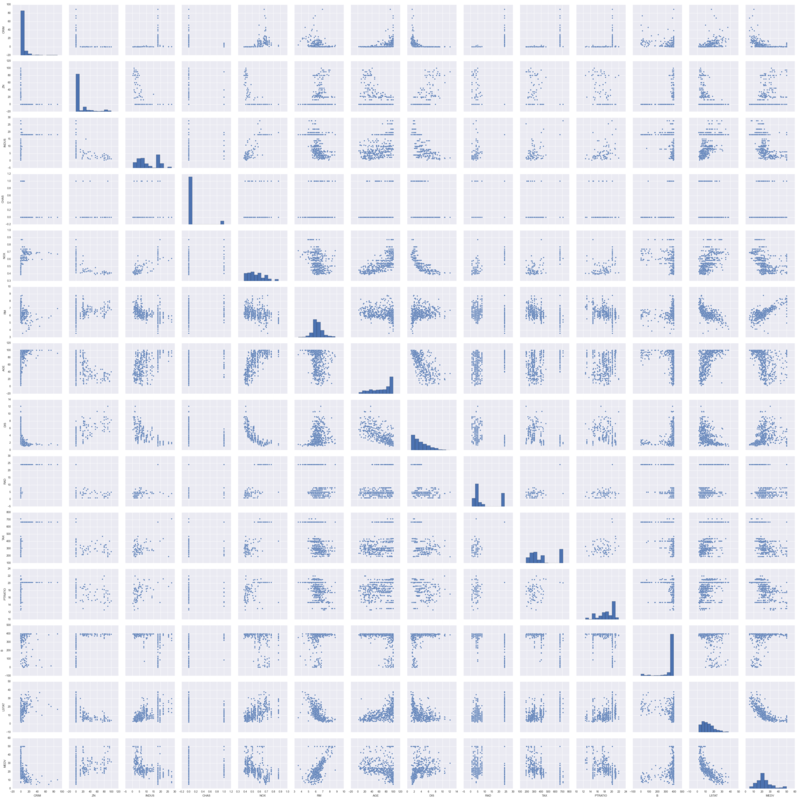 The seaborn package offer corrplot() which is exactly what we need (example). The lower triangle show the correlation values as colored squares, on the diagonal are the attribute names and in the upper triangle are the actual correlation values and significance represented by stars. Also there is a colorbar. We can change the correlation method with the method parameter (the same variants available as in pandas). We might want to adjust the plot to look better. The default font size is a quite big and looks ugly. I'm not aware of a clean way to decrease it, thus as a work-around we can enlarge the plot. If you know, please comment. 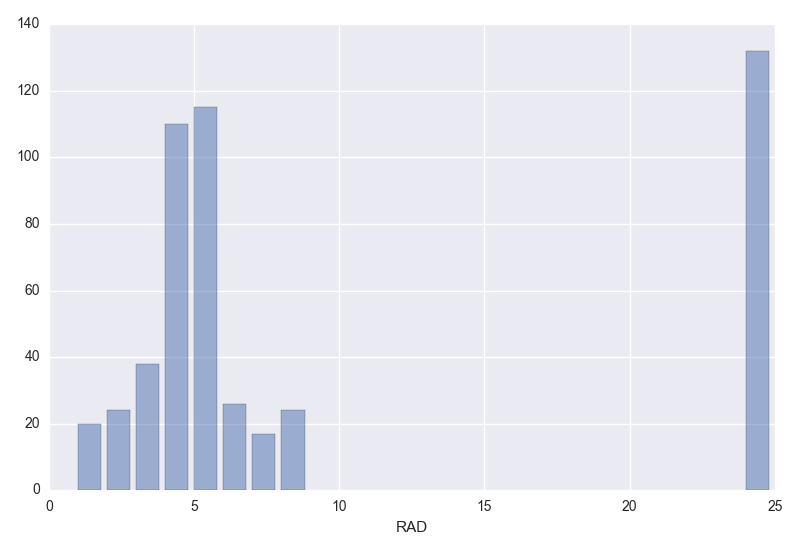 Next we'd like to plot a histogram of values for each attribute. It acts as an estimation of the probability density function and gives us a better understanding how values of each attribtue look like. 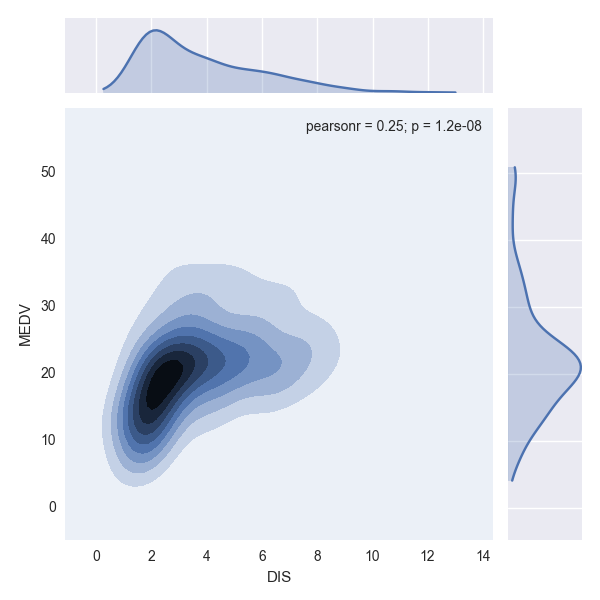 Seaborn has a plot dedicated for distributions - distplot(). Moreover, various possibilities in plotting distributions are beautifully covered in its documentation: Visualizing distributions of data . distplot is able to combine a histogram with a kernel density estimation (KDE) plot (it looks like a smoothed histogram) into a single plot. For us it would be useful to plot real-valued data. However, for integer-valued data (like categories) automatic quantization into a pre-defined number of bins might not be the best option. We'd rather like to quantize according the original distinct values. 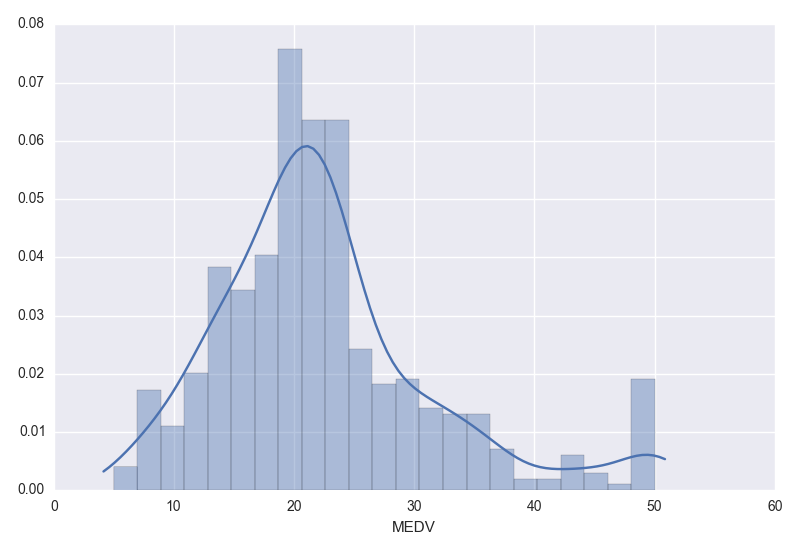 For that we can just compute this kind of histogram ourselves and use the bar plot. 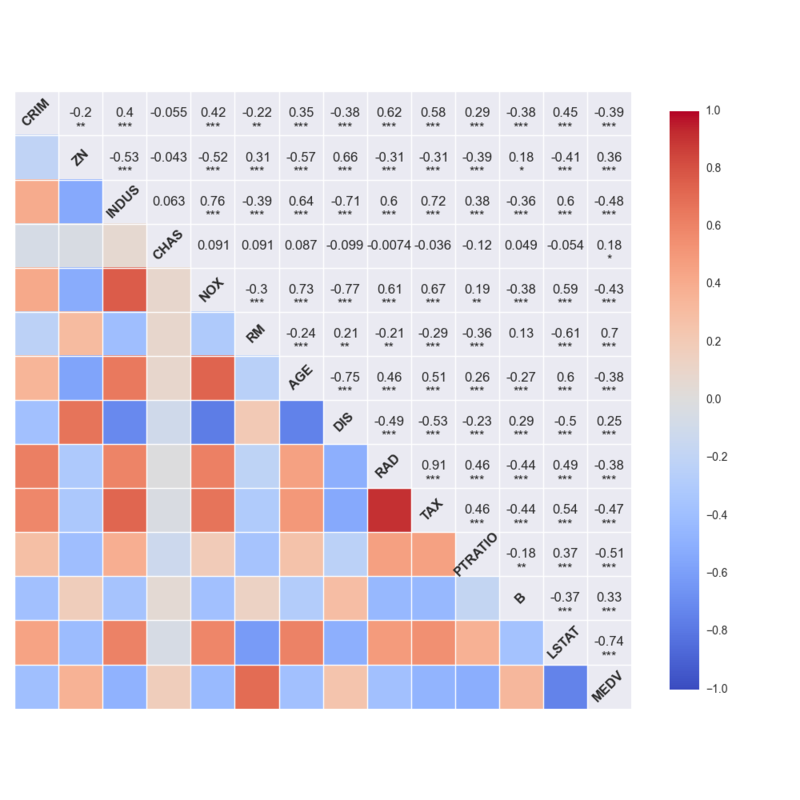 So far we've visualized the distribution of values of individual attributes and correlation of attribute pairs. We can dig deeper into the relation of attribute pairs by examining their joint distributions. We'd like a 2D plot with each axis representing the particular attribute range and the points on the plot representing the probability that both attributes have the particular values at once. 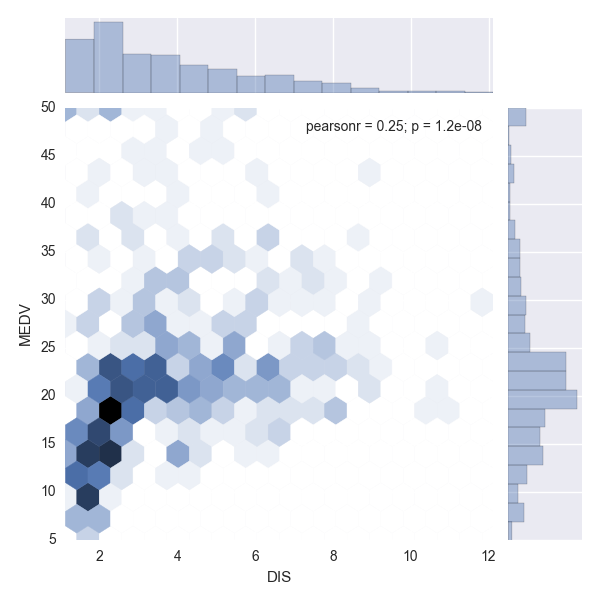 Also plotting 2D distributions is nicely described with many examples in the seaborn docs. If we have a few data points we can plot a little dot on that 2D position for each observed point - this is called a scatter plot and is available via plt.scatter(X, Y). Rather than individual observations we'd rather estimate the joint PDF density and plot it color-coded. There are various approaches. Having a lot of data points we can fake it by a scatter plot with semi-transparent markers that add up. Another possibility is to aggregate data points over 2D areas and estimate the PDF this way. Its a 2D generalization of a histogram. We can either use a rectangular grid, or even a hexagonal one. Otherwise we can estimate the PDF smoothly by convolving each datapoint with a kernel function. It is possible with sns.kdeplot(). Plotting exact observations (as with a scatter plot) may lead to "over-fitting", while plotting smoothed kernel density estimation may lead to to much generalization. A medium trade-off between both is using the hexagon-aggregated 2D histogram. But as always the human observer who will assess the data must use their own judgement. There's N * (N - 1) / 2 unique pairs of attributes, ie. quite a lot. In order to have a big picture for quick overview we might want to display a rough joint distribution plot for each pair in a single image. That's exactly what pairplot() from seaborn does - scatter plots, one for each pair, are aligned into a matrix and the diagonal is filled with attribute histograms. That's it! You can of course do it by hand using matplotlib, but why reinvent wheel and not leverage the power of existing libraries. Note that the resulting image is quite big. When plotting non-interactively I found a problem that the matplotlib window still opens. In order not to do this I found this work-around. 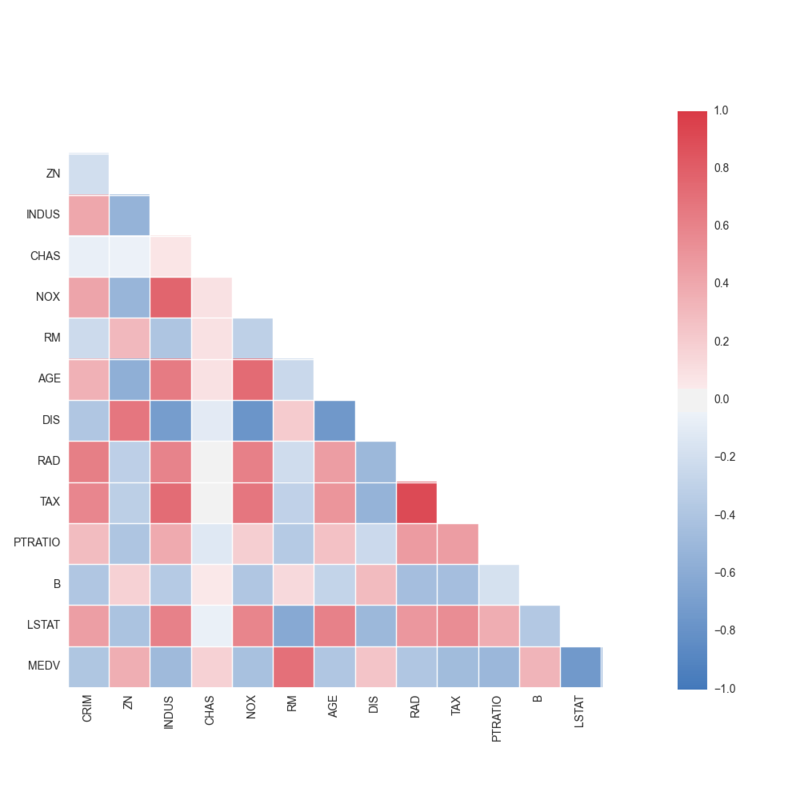 Before importing the matplotlib.pyplot package, select the backend to 'Agg'. While developing and running a script it is useful to know the intermediate status. The most basic tool in Python is the print() function. The problem is to differentiate what are the program results and what are some helpful debugging messages. The standard solution is to use logging. To each message we can specify the log level (eg. DEBUG, INFO, WARNING, ERROR) and then filter only relevant messages. Eg. DEBUG and more important messages during development, and INFO or WARNING and above during normal usage. Simplest we can log directly to the standard output (console), or we can log to files, etc. For more information look at the Python logging module documentation. Also we'd like to make a text report that's easy to publish. One way would be to copy and paste the script output. But that's human work and we like automation and replicability. Another almost as simple solution is to print to a file. The print() function supports this out-of-the-box, the only thing is to specify an open file. In this article we described the basic process of examining a dataset for further usage eg. in machine learning or data visualization. We took the outline of basic questions from the Applied Machine Learning Process book and applied them to the classic Boston housing dataset. We described how powerful tools like Python and its libraries can help us to get quickly to the results while leaving us the freedom to get more complicated if needed. The actual results along with a lot of plots are presented separately in two reports ( problem-definition.md, data_analysis.md ). I'm happy to try the process by hand without the usual time distress of work projects. Now I have a template of what questions to ask, how the answers might look like, there's a sample script implementing the basic computations and plot which might be tailored to other datasets encountered in future. It's released as open-source, so you can base your futher data examinations on it. I hope you found something useful or inspiring here and feel free to share your own data exploration reports or code. Get in touch on Twitter: @bzamecnik.